﻿ What kind of bait to catch a squirrel? What kind of bait to catch a squirrel? What Is The Best Bait To Catch A Squirrel? - Pesky little critters can find their way in to almost every home eventually, or they can be present in a yard or garden causing trouble there too, and one way to deal with these pest animals is to trap them and either to remove them or humanely destroy them. One of the parts of the trapping process is deciding whether or not to use bait to try and draw the squirrel into the trap, and to consider the type of bait that you should use that will be irresistible to the little animals. However, along with the bait there are a number of different factors that also need to be considered if you are looking to catch squirrels successfully, and these should all be taken into account. Most people will know that squirrels have a natural habit of collecting nuts and then gathering them in caches around their territory, so naturally one of the best types of bait for a trap is nuts, and these can range from peanuts and other nuts eaten by people to wild nuts gathered from a local woodland. Other nut products can also prove to be very effective as a bait, with peanut butter being very good, along with a few drops of almond extract placed on to a piece of bread. Apart from using nuts and nut products as bait, squirrels are also fond of fruit such as apples, and even popcorn, so both of those can be used successfully as bait too. Make sure that you position the bait in a location where the squirrel has to go entirely into the trap to get to it, and where it has to trigger the trap in order to get the bait. Sometimes, if a squirrel is thirsty, fruit like oranges are great, because the animal knows that there's water in the fruit. Oranges are a great squirrel bait, as seen below, in this one-way trap mounted under a soffit. There are several different types of trap that you can use to catch squirrels, and while some of them are humane traps that will allow you to relocate the animals, there are also lethal traps available that will kill the squirrel. The first type of cage trap is a repeater trap, and essentially it is a long cage that can catch several animals at once, and is usually mounted over an exit point. There is also the more traditional cage trap, and this is one that is placed either in the attic or on ground level near where the animals are active or around a property. The lethal body grip traps are usually best left alone, as they can often kill other animals other than the squirrels that you are targeting. When it comes to picking a location for your trap, if you are going to be using a repeater trap, these are best mounted over the entry hole that the squirrels are using to get in and out of an attic, such as over a vent or beneath a soffit that has been damaged by the squirrels. Cage traps are a little more difficult to locate, as they are not generally as successful as the repeater traps, and are more likely to be avoided by the animals. Look for areas of high traffic, such as a squirrel latrine or near points where the animals are getting in and out of a property, and make sure the cage traps are washed and installed with gloves, as squirrels do have a good sense of smell and can often smell you on the trap. If you are having trouble when you are trying to trap the squirrels that are causing a problem for you in an attic or wall cavity, one solution is to try a different approach and to try and exclude the animals rather than trapping them. This method will require you to carry out a thorough search of the cavity or attic, and then to seal all of the entry holes but one. Over the final entry hole, affix an exclusion funnel which will allow the squirrels to get out but will prevent them from being able to get back in to the attic or cavity. The reality is that bait only really plays a peripheral role in most squirrel trapping situations, as the repeater traps do not really need to be baited, while it is also quite difficult to bait a lethal trap effectively. 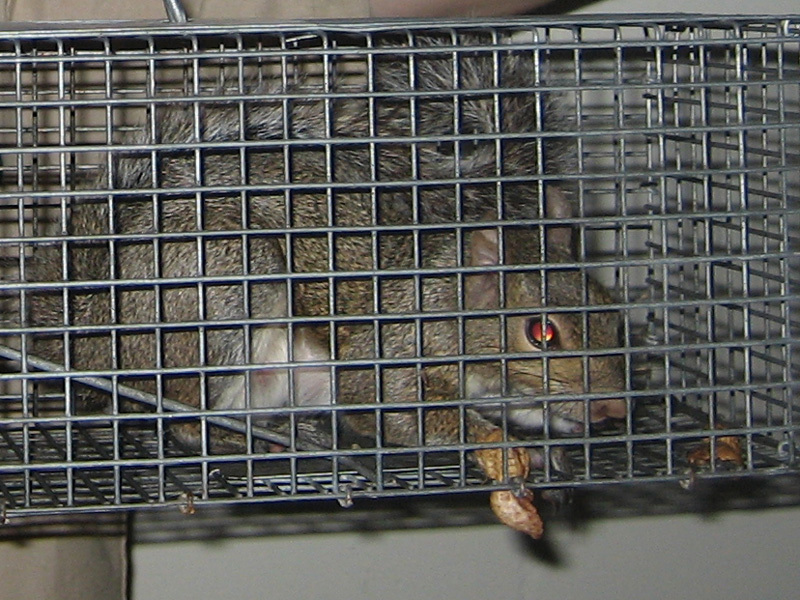 Cage traps are not quite as effective as other methods of catching squirrels, which is why they are not used as frequently as other types of traps. In these traps the bait certainly can be useful, and will help to attract the squirrel, but in reality, the location of the trap is still likely to be more important than the bait. How To Trap a Squirrel - Methods for catching squirrel in cage traps. Go back to the main Squirrel Removal page for more information about what type of bait to use to trap a squirrel. What kind of food do you put in a squirrel trap to catch the animal? What is the best squirrel bait? What is the best bait to trap a squirrel? If there are squirrels present in your property, then it is really a complicated issue because their presence is always accompanied with a variety of issues and disturbances. Most people prefer to use traps for getting rid of these creatures, but an important point to keep in mind is that trap will be only effective with good bait. In fact, it will not be wrong to mention that a trap will be as effective as the bait. It is simple to understand that you can’t expect that squirrel will get inside trap without any bait in it. Therefore it is important that you should focus upon selection of proper bait otherwise efforts will be wasted. Now the big question is that what is the best bait to trap a squirrel? Proper answer to this question will be discussed below. First of all we suggest that you should avoid using poison in all cases. Using poison is going to introduce a good variety of complications especially when there are kids or pets living in the house. The poisonous bait can fall in the hands of kids or pets can also consume it. Worst happens when squirrel eats the bait and goes into its hiding place and die. There will be smell from the dead body which will only be removed once you will locate the decaying body of the animal. The most easiest and effective kind of bait that can be used for trapping squirrels is none other than peanut butter. The best part is that you can easily get it from local stores in fact every house has peanut butter present in kitchen area. When it will be used as a bait squirrel will be trapped in minutes. There are other different types of baits also present, but the results which are provided by peanut butter are simply amazing. Nuts are another good option because squirrels are simply in love with them. Therefore, we suggest that you should give a try to use peanuts and sunflower seeds. Don’t uncover the nuts from their shells and make sure that these are unsalted squirrels will defiantly get attracted towards them. However if we make a comparison between peanut butter and nuts then altogether nuts are the best kinds of bait that are present. In case you still face difficulty in trapping squirrels, then we suggest that you should get in touch with an expert. Go back to the main Squirrel Removal page for more information about What is the best bait to trap a squirrel.